Much to yesterday’s guests’ delight, they were greeted by a cow and calf in the neighbor’s yard. They took many pictures. I took none. This morning at breakfast the guests told me that they were delayed getting into their room late last night because the moose were just hanging out in our backyard. They were eating the rose bushes. The guests also mentioned that the moose were just lounging in our front yard this morning. I went and looked. Sure enough! They were there. Still I took no pictures. 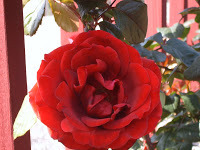 The picture is of one of our 15 roses bushes that we keep on our deck just so the moose cannot eat them.